Filmed 2 years before “Black Christmas”, yet released the same year, this seasonal shocker revolves around a dark secret several prominent members of a small town share in regards to a large mansion on the outskirts of the community. When the living heir of the estate announces he intends to sell the property to the committee (to be destroyed), an insane mental patient escapes a sanatorium and comes home for a visit. 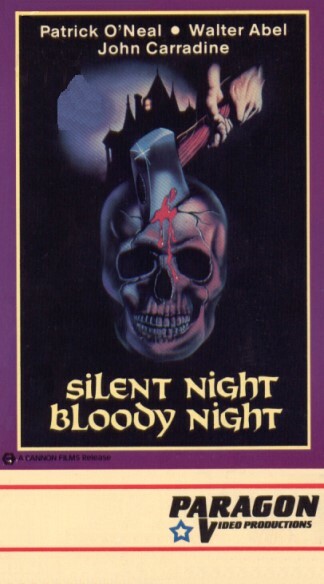 Whereas “Black Christmas” features calls coming from a killer that’s hiding inside the house already, “Silent Night, Bloody Night” deals with the murderer calling each of the people that they intend to take vengeance on one by one, inviting them to the property. Fearful that their secret may be discovered (a pretty disturbing one at that, which I will not reveal for those who may have not seen it or would like to), they each visit the old dark house that they hate so much and long to destroy forever. This film features a young Mary Woronov who, in my opinion, plays her role very well. In fact, I’d go so far as to say that she has a very “Laurie Strode” quality about her in this one. People who get to see this underrated classic, pay attention to the final climax chase scene at the end. When you hear her screaming and whimpering, you’ll see what I mean. I love this movie and watch it annually every year. I recommend checking it out on the Mill Creek Chilling Classics 50 Pack compared to other sources I’ve found, because it’s much more touched up than its VHS release on Paragon and even has additional scenes.